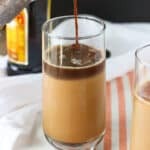 This Extra Dirty Iced Chai Tea Latte features chai tea latte concentrate, milk, a splash of Kahlua, and a shot of espresso all poured over coffee ice cubes! Prepare coffee ice cubes and brew espresso in advance of enjoying these drinks. In two glasses, add coffee ice cubes and into each glass, pour about 4 oz. chai tea latte concentrate, 4 oz. milk, and 0.75 oz Kahlua. Stir to combine. Pour about one shot of espresso over top (or desired amount) and stir again. Enjoy! I used plain leftover drip coffee to make coffee ice cubes. Nutritional info is estimated based on a regular (not sugar-free) chai tea concentrate and 1% milk.